Traditional 3D programs are notoriously difficult to use and understand. 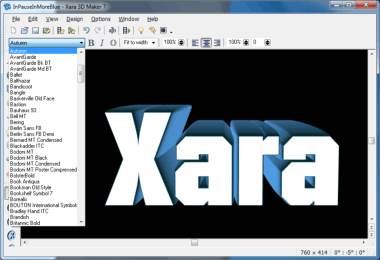 Not so Xara 3D Maker. Unlike many 3D programs that take an age to learn and understand, Xara 3D Maker has been created to perform one job, and performs that job with style, speed and simplicity. 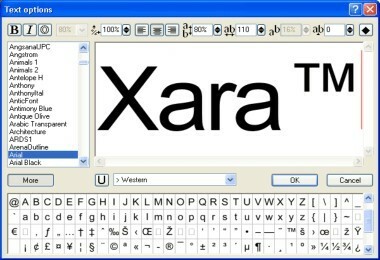 Xara 3D Maker is solely designed to create the highest quality 3D text and graphics, such as headings, logos, titles and buttons. It's the perfect way to add impact to your web pages, mailshots, movies and presentations (all images are fully anti-aliased for that smooth, professional quality). 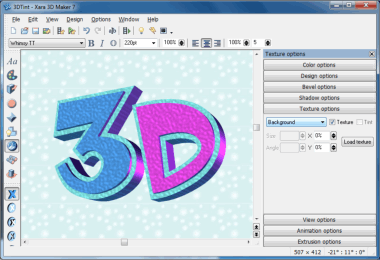 Xara 3D Maker can also create awesome 3D animations in seconds - GIFs, AVIs and simple Flash movie sequences - and you can even enhance your desktop by saving any animation as a screensaver! 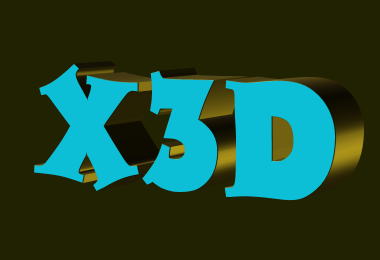 You'll be creating 3D text headings in minutes and it's a snip to add borders or backgrounds. What's more you can import 2D shapes and extrude them into 3D. Text headings can use any TrueType font installed on your computer. 13 fonts are included in the trial download and there are 64 in the full download. Simply select the font from the drop down menu and type away, you’ll create your first heading in seconds! There's full control over every aspect of the appearance of the text, including alignment, sub & superscript, line spacing, tracking and kerning values for individual characters or over whole selections. There's also instant access to full character sets from within the text dialog. But you're not just limited to text headings. You can create non-text headings by importing 2D graphics as Windows metafiles (WMF and EMF) or Xara Xtreme/Xara Designer/Webster files (XAR and WEB) and extruding the outlines. An automatic design-making tool instantly adds a border to your text or turns it into a button, board or board with holes at the click of a button. 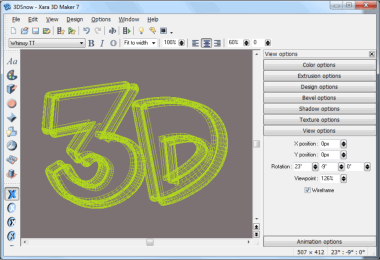 Xara 3D Maker offers top quality on-screen display, with full anti-aliasing, and real-time solid shading with optional error-diffusion dithering. New in V7: A View Options panel which gives additional advanced control over the X/Y position of an image against its background, allows you to precisely change the angle of rotation and viewpoint, and offers a new wireframe mode which can simplify the display and speed up animation viewing time. Xara 3D Maker offers comprehensive, interactive and intuitive controls over everything including extrude depth and bevel, text styles, colors, textures and lighting. All the contols are full interactive - so for example you can change the 3D extrude depth by simply dragging on the side of the heading! And you can position the heading in real time around three axes by simply dragging the image on screen. 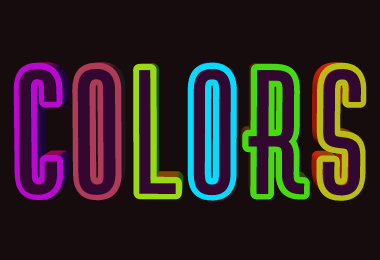 The many attributes such as bevel, color, fonts, textures, animation and text settings can be applied to individual letters or whole headings. 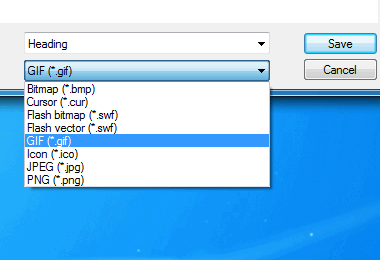 The Style Picker allows you to easily grab any or all of the settings of an existing image and apply them to another. There's no less than 33 different bevel types, and the bevel size can be adjusted by simply dragging the bevel edge on screen. The lighting is interactive and easy-to-use with three adjustable light arrows which can be dragged around the image on-screen. There are flexible interactive controls over the color and/or texture of every part of the image, and the background. 21 textures are included in the trial download, and over 400 in the full product. 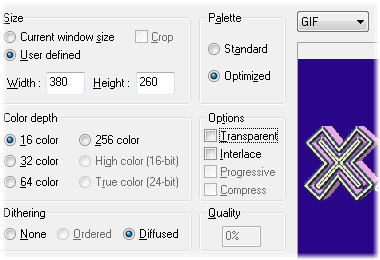 You can also import your own GIF or PNG files to use as foreground or background textures. Textures can be scaled, rotated and colored. You can make the images matt or shiny. They can also be displayed with front and back faces or you can make them hollow. Images can have a soft-edged shadow, and an intuitive interface allows you to easily alter the shadow blur, transparency and color. With so many controls to play with it's easy to get carried away. But don't worry - unlimited undo makes experimentation easy! There's a huge range of animation types to choose from, with full control over speed, direction, loops etc. Images can be animated in many different ways, such as Rotate, Fade, Ripple, Pulsate, Step, Fade and Swing, using a simple interface. New in V7: headings can now scroll in and out. You can set the direction and speed, so for example an image could drift in slowly from the top and exit quickly right! Absolutely perfect for creating opening titles and closing credits for movies. Animations can be exported as AVIs, making them perfect for opening titles and closing credits for movies - especially the new scroll in and out animations. Additionally V7 can export animations with transparent backgrounds in a special MAGIX format, compatible with MAGIX Photostory and MAGIX Movie Edit Pro, so that they can be superimposed as 3D animated captions on movies and slideshows created in these MAGIX products. The Animation Picker lets you easily copy the animation settings of one image to another. You can easily apply different animations to individual characters or sections of text. What's more, you can step-through multi-page animations of different images. The animation controls are comprehensive. 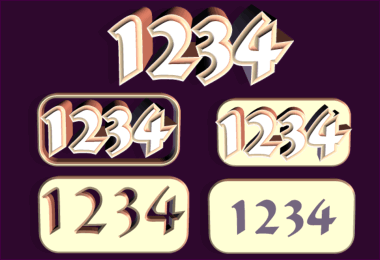 For example you can set the number of frames in a sequence, the rotation direction, the speed, pause and number of loops, all with simply, intuitive controls. An animation time line allows you to step through each frame, pause and export a single frame. Lights and text can be rotated separately. Xara 3D Maker is great for creating animated buttons. 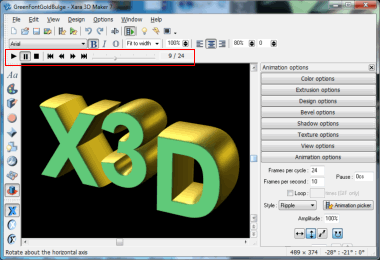 Xara 3D Maker can export in all the common web formats - GIF, JPEG etc - and you can even export your 3D animations of screensavers! Xara 3D Maker can save images in all the formats you'll need for use on-screen, in presentations or for movie titles and credits, including JPEG, GIF, BMP, PNG (including full PNG alpha channel), ICO (icon) and CUR (cursor). 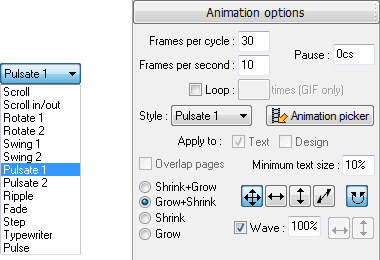 And for animations you can export as animated GIF, AVI and SWF (vector and bitmap). Any 3D animation can also be exported as a screensaver. The export dialog offers optional background transparency, so your 3D image can blend seamlessly into any page background. The export dialog also offers color reduction and palette-optimization for maximum quality with the smallest file size, ideal for web pages. As you would expect there is also complete control over the image size, including a handy Fit To Width feature (with pixel size shown on screen).